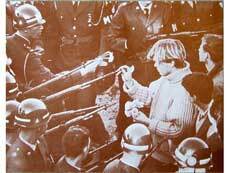 Flower Power and it’s companion, Make Love, Not War, became the antiwar slogans of the times, and were given a boost by a famous photo from the 60s shows a teenager placing flowers in the barrels of National Guardsmen rifles. Flowers were the symbol for Passive Resistance and non violence. Ginsburg coined the phrase in a 1965 article “How to Make a March Spectacle”. The concept was that protestors, rather than appearing threatening, should hand out “masses of flowers” to the police, authorities, and spectators. The protests would then seem more like street theater and become more appealing to the mainstream. And of course, John Phillips of The Mamas & The Papas wrote San Francisco (Be Sure to Wear Flowers in your Hair) which is known as the unofficial anthem of the counterculture movement”. At first it was just hippies and hippie wanna-bees that wore flowers but it rapidly spread mainstream. The late 60s saw flowers from Flower Power merged into pschedelia and flowers began showing up everywhere. Pop artist Peter Max added day glow colors to a stylized design and flowers went mainstream.